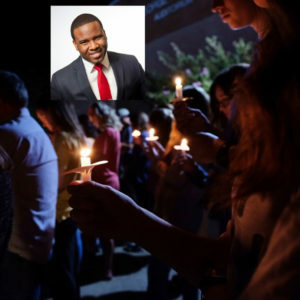 Students at Harding University in Searcy, Ark., remembered recent graduate Botham Shem Jean at a candlelight vigil on campus Monday night. Once again, we are experiencing the pain, sorrow and anger caused by the death of another black male at the hands of a police officer. We ask with dismay, how can it be that an officer meant to serve and protect instead shoots and kills an innocent person like Botham Jean? Our hearts and prayers go out to his family, and we demand a speedy, transparent and just conclusion to this tragedy. This case is unusual for many reasons. There was no “street encounter” between Officer Amber Guyger and Jean. Apparently, they did not know each other. Officer Guyger claims to have entered Jean’s apartment believing it to be her own and believing Jean to be an intruder. We will, of course, learn much more about the facts of this encounter as the evidence is revealed. Law enforcement is saying they will charge Officer Guyger with manslaughter. Why not murder? What is the difference between the two offenses? As defined by Texas law, murder is committed when a person intentionally or knowingly causes the death of an individual or intends to cause serious bodily injury and commits an act clearly dangerous to human life that causes the death of an individual. The range of punishment for murder is confinement in the Texas Department of Criminal Justice for life or any term of years not more than 99 years or less than five years. An optional fine not to exceed $10,000.00 may be assessed. As defined by Texas law, manslaughter is committed if a person recklessly causes the death of an individual. Texas law further states, when the offense is assaultive in nature, such as shooting an individual, that a person acts recklessly, with respect to the result of his conduct when he is aware of but consciously disregards a substantial and unjustifiable risk that the result, in this case death, will occur. The risk must be of such a nature and degree that its disregard constitutes a gross deviation from the standard of care that an ordinary person would exercise under all the circumstances as viewed from the actor’s standpoint. The range of punishment for manslaughter is imprisonment in the Texas Department of Criminal Justice for any term of not more than 20 years or less than two years. An optional fine not to exceed $10,000.00 may be assessed. From 1991 to 2012, I was one of your state district judges, and I have practiced as a prosecutor and as a defense lawyer handling hundreds of cases. I am not aware of a case in which a person shoots another person in the torso, with death as the result, and is charged with manslaughter. In Dallas County, the longstanding practice of our law enforcement agencies, in similar cases, has been to charge suspects with murder by either intentionally and knowingly causing the death of an individual or by intending to cause serious bodily injury and committing an act clearly dangerous to human life that causes the death of an individual. This deviation from the norm begs many questions. Are there facts in this case that warrant a departure from standard practice? Is the fact that Guyger is a police officer the reason to bring a charge of manslaughter instead of murder? Jean’s family and this community deserve a transparent and rational explanation for the departure from standard charging protocols. Can we expect Officer Guyger’s attorneys to raise well-recognized defenses? Yes. Expect the defense to raise the issue of “mistake of fact.” In Texas law, “mistake of fact” is defined as follows: it is a defense to prosecution that the actor through mistake formed a reasonable belief about a matter of fact if this mistaken belief negated the kind of culpability required for commission of the offense. How might “mistake of fact” apply to this case? Entering an apartment that you thought was yours. In other words, Officer Guyger’s defense could argue that she was not a trespasser or a burglar or someone intending to commit a criminal act, but rather someone who mistakenly entered the wrong apartment. Additionally, if Officer Guyger’s attorneys argue “mistake of fact” they will likely also argue that she had reason to defend herself. It will be incumbent on the prosecution to show that she did not have justification such as the use of deadly force for self-defense, or deadly force to prevent the other’s imminent commission of arson, burglary, robbery, aggravated robbery, or theft during the nighttime or criminal mischief during the nighttime. Based on what little information we have so far, this is the best explanation of the law that I can provide for the community. Left unanswered is why Officer Guyger’s arrest and charging were delayed. Was this delay in part due to the fact that she is a police officer? I suspect so. Another question left unanswered is whether Officer Guyger, based on the facts and standard protocol, is being charged with an offense a level below what you or I would be charged with under similar circumstances. Certainly, it appears she is benefitting from leniency. As I said, the family of Botham Jean and the community are owed a transparent and rational explanation for how this tragic situation has been handled to date. Let us hope we get that. Justice demands it.